LCD and CRT parts scattered behind the property of the site where an LCD monitor from Germany -- ended up. Exporting scrap LCDs from Europe to Thailand is illegal due to the Basel Convention and the EU Waste Shipment Regulation. Copyright BAN, February 2018. This equipment was then delivered to places where consumers are expected to take their waste – most often government-approved takeback stations. They found that 19 (6%) of the tracked scrap equipment was exported, including 11 very likely illegal shipments to the countries of Ghana, Hong Kong, Nigeria, Pakistan, Tanzania, Thailand, and Ukraine, outside of the EU. BAN asserts that leakage of this significance perpetuates an EU waste management regime on the backs of the poor and vulnerable. This would be directly contrary to the originally envisaged “circular economy” which can only responsibly exist by eliminating externalities and leakage from the system. 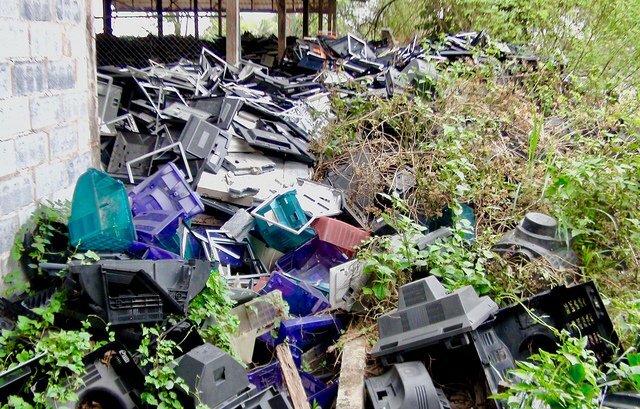 BAN fears that recent efforts by the electronics manufacturers (Digital Europe) and the EU doing their bidding to create a “Repairables Loophole” in the Basel Convention will allow a tsunami of broken, low-value electronic scrap to flow from Europe, undermining the original intent of the Basel Convention, and spelling the death knell for a circular economy. “There is far too much bemoaning illegal exports, while at the very same time, the EU is hypocritically works to make such dangerous exports legal. The answer to criminal activity is not legalizing that activity but rather improving enforcement to ensure the future health of Europe is not dependent on poisoning the rest of the world,” Puckett said.